On Her Mighty Debut, Yola Pushes Through To 'Walk Through Fire' Two and a half years ago, the British singer had a career-sparking moment at a music festival. Now, she's releasing her powerful debut with the help of producer Dan Auerbach. Yola's Walk Through Fire comes out Feb. 22 via Easy Eye Sound. Nashville's annual Americana Music Festival and Conference has hosted many star-making moments since its 2000 inception. But with the festival's massive growth in recent years, it's become harder for emerging acts to stand out, making true epiphanies all the more exciting. In September 2016, Yola (then performing as Yola Carter) had just such a moment. Two and a half years later, the British singer-songwriter is releasing her debut album, Walk Through Fire, which follows her 2016 EP Orphan Country. 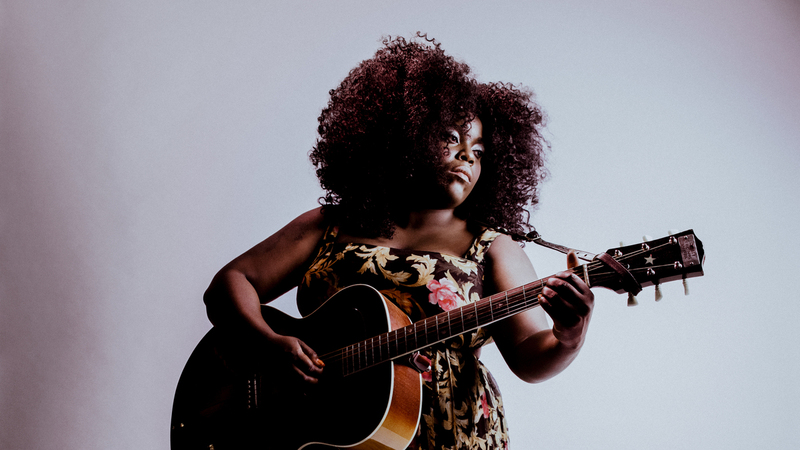 What initially drew AmericanaFest fans and critics to Yola — her sonic palette, which spans country, folk, classic soul and '70s-era Britpop; her emotive songwriting, which oscillates between vulnerability and chest-pounding empowerment; and her truly powerful voice ­­— abounds on Walk Through Fire. Walk Through Fire takes its name from a devastating house fire, which left Yola injured and shaken. It also references her survival of an abusive relationship, which took its toll on Yola's emotional well-being. To help herself heal, she wrote songs that touch on both of these incidents and offer ways forward. (In the title track, she references a "rescue vessel" she's certain will take her to calmer shores.) The resulting album is a bold statement from a woman who's been to hell and back, and is ready to share her stories. Yola worked with The Black Keys' Dan Auerbach to create Walk Through Fire, with Auerbach producing and the pair co-writing the album's songs alongside guest writers like Bobby Wood, Pat McLaughlin and Dan Penn. They also assembled an impressive team of studio musicians, including bassist Dave Roe (Johnny Cash), pianist Wood (Elvis Presley) and legendary harmonica player Charlie McCoy. Vince Gill lends backing harmonies to the soul-baring torch song "Keep Me Here," while bluegrass greats Molly Tuttle, Ronnie McCoury and Stuart Duncan add a laid-back twang to the title track. Auerbach was first drawn to work with Yola after watching a video of that AmericanaFest performance, and the pair crafted a 12-song collection that showcases Yola's otherworldly vocals and compelling songwriting. Sonic touchstones on Walk Through Fire include the stomps and hollers of Appalachian string bands, the baroque rock of Sgt. Pepper, the melodic sweep of Laurel Canyon, the lush strings of orchestral indie pop and a healthy dose of Dolly Parton. In less capable hands, such disparate influences could sound disjointed, but in Yola's they serve as the only backdrop worthy of her agile voice. "It Ain't Easier" is built on a classic soul chord progression, with fiddle and Wurlitzer conversing to wrenching effect. Yola's vocal takes cues from traditional country and girl-group soul in equal measure, allowing plenty of opportunities to show off her preternatural sense of melody. The title track draws on string-band twang, a sound which pairs perfectly with the lyrics' trial-by-fire tale of romantic redemption. "Faraway Look" has a bombastic, ELO-esque arrangement that serves as the foundation for a soaring soul-pop power ballad about romantic uncertainty. Hype can be fickle, but with Walk Through Fire, Yola proves that the AmericanaFest excitement was anything but a fluke. It's the work of an artist sure to stun audiences for years to come.